We Wish to Inform You That Tomorrow We Will Be Killed With Our Families by Philip Gourevitch is a kind of history of the Rwandan genocide. This genocide always puzzles me because the Hutu and Tutsi's seemed to have gotten along, they intermarried, they lived and worked together, and then bam, in three months time, 800,000 Tutsi's are murdered, just like that. 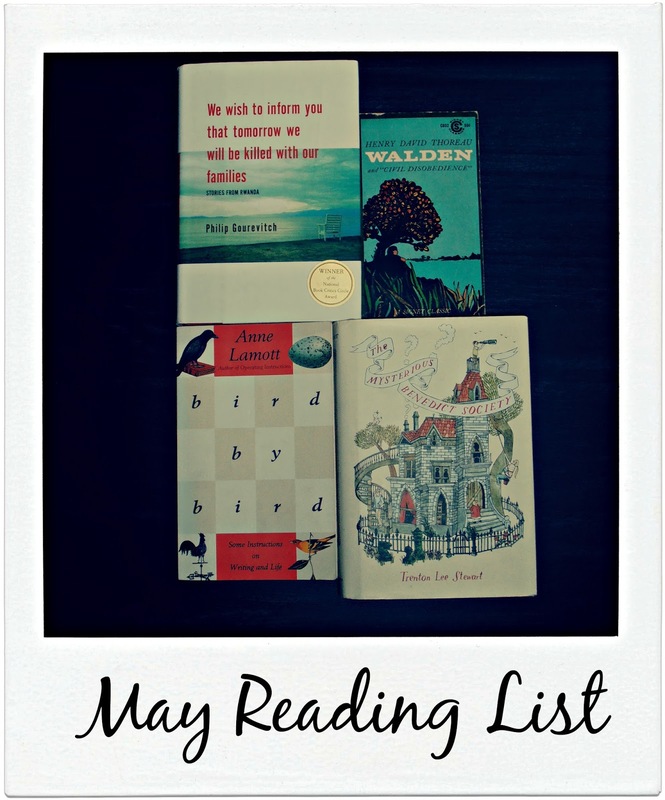 Walden and "Civil Disobedience" by Henry David Thoreau is one of those books I should have probably read ages ago, but never got to, so I'm choosing it for this month, as my classic pick. Bird by Bird by Anne Lamott has been on my book hunting list for over a year and I was so happy when I found it on Bookmooch a few months ago. I love her writing style and how honest she is and I wish we could be best friends for life, in a totally none creepy way. My friend who used to be a massage therapist at the chiropractor's office I worked at kind of reminds me of Anne Lamott. Or maybe Anne reminds me of her and that's why I like her so much. Anyhow, this is a pep talk kind of book for writers or want to be writers and I'm really looking forward to jumping right in. So what are you reading this month? Or have you read any of my picks? What'd you think?